The history of oilmen and the energy bankers who loan them capital is inextricably bound together. Energy bankers have reacted, adjusted and evolved alongside the same business cycles, regulatory changes and commodity-price gyrations that have challenged the generations of oilmen they banked. In many respects, however, it is remarkable how little has changed during the past 100 years in the fundamentals of lending against collateral that has been hidden underground for millions of years. 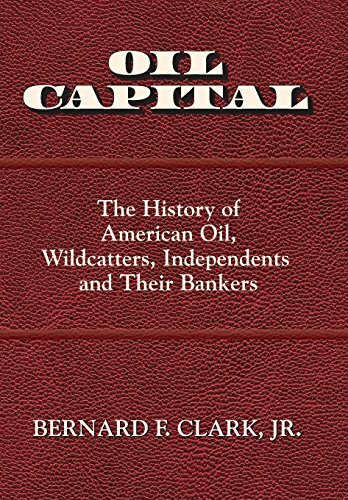 Nor has there been much change in the relationship between the early wildcatters willing to risk their—and their banker’s—last dime and the bankers who cautiously evaluate the oilmen and their collateral. Along with manpower, rigs and drill pipe, capital has always been a critical tool in the exploration for and development of oil and gas. From the earliest days of the industry, producers have required more start-up capital for acquisition, drilling and development of oil fields than can be generated out of cash flow from existing production. The accomplishments of oil companies were and are as dependent upon access to capital as access to the hydrocarbons they seek to exploit. This book tells the story of the enduring relationship of oil and gas producers and oil and gas bankers in the context of the evolution of the two industries. Manufacturer: Bernard F. Clark, Jr. Publisher: Bernard F. Clark, Jr. Studio: Bernard F. Clark, Jr.